"Middleburg United Methodist Church Marker Middleburg, FL" by George Lansing Taylor Jr. 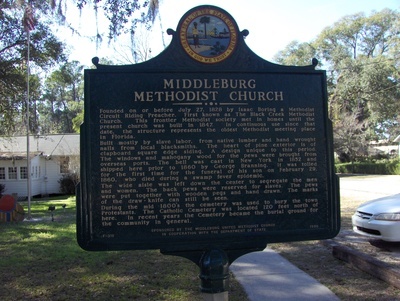 Historical marker for the Middleburg United Methodist Church, Located in Middleburg, Florida, the church was previously known as the Methodist Episcopal Church at Black Creek. This oldest Methodist meeting place in Florida was built in 1847.